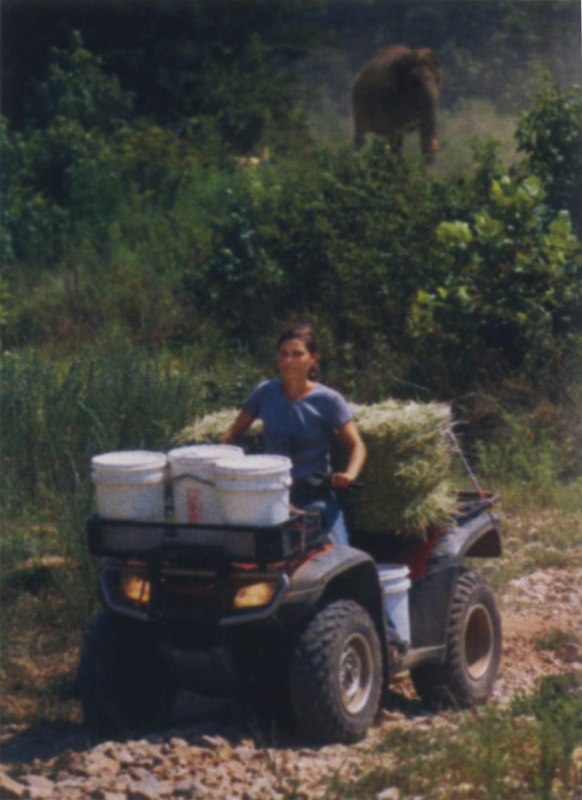 Joanna started as an intern at the Sanctuary in August 1998. One day during her internship, Joanna woke up from a dream. She was reminded of a trip she'd taken to the Nashville Zoo about three years prior, long before she ever thought of a career serving animals. The dream reminded her of watching an elephant being bathed at the zoo and how awe-inspiring the elephant was to watch. Something about the dream prompted her to engage in a midnight hunt through the photos she had taken while visiting the zoo. To her surprise, the photograph she was searching for was of Scott and Carol bathing Tarra at the Nashville Zoo—their last stop before creating the Elephant Sanctuary. Joanna is a native New Englander who originally came to the South to teach in the Appalachian Mountains. She later moved to Nashville to begin a graduate program in organizational psychology. 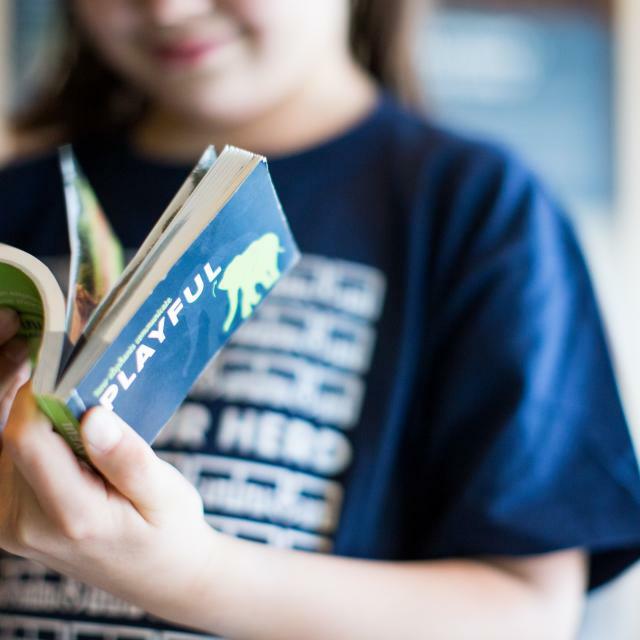 Near the end of the program, she realized she felt no passion for the subject—her heart was with animals. So she left school and started to investigate ways to gain experience in the field. Joanna applied for an internship at the Sanctuary. She was accepted and rewarded with an opportunity to do something she wanted at a place that needed a person like her to do it. When asked what a lead caregiver does, Joanna's answer was, "Anything at a moment’s notice and then some." Her responsibilities included the daily care of elephants and supervision of fellow caregivers and volunteers. During her time at the Sanctuary Joanna not only cared for elephants on a daily basis, she also coordinated the intern program that brought her to the Sanctuary in the first place. For Joanna, what had become the most rewarding aspect of being at the Sanctuary was observing the elephants building relationships with one another, healing and becoming whole. Being at the Sanctuary to observe that process and helping to create an environment that supports it were by far the best parts of the job. She said on many occasions, "Working in a place where the philosophy is so progressive, where things are always growing and never stagnant has been great for me in my own growth as a person and a caregiver." Joanna's parents asked that all donations for Joanna be sent to The Elephant Sanctuary. Nine months have passed and still we are not fully able to grasp the reality of Joanna’s passing. It is not denial that we are experiencing; we all fully understand that Joanna is no longer alive, but her spirit is so strong; it is as if only her physical form has left this planet. In the book, How To Go On Living When Someone You Love Dies, the author states that when a person you love dies you don’t lose that person from your life, you simply have to learn how to relate to them in a different way. Joanna’s spiritual presence is felt and touches us deeply, creating the opportunity for each of us to develop a new relationship with her. Carol, Mark and I would like to thank all of you for keeping us in your thoughts and prayers since we lost Joanna close to two months ago. The power of your prayers and thoughts, our faith, our knowledge that Joanna was doing what she was created to do and making a difference have all helped make this difficult time more bearable. Your tributes, your emails, and your cards have given us a deeper understanding of our precious girl. Your moving words have given us even more reason to celebrate Joanna's life while we come to accept her death. A friend who lost an older son shared with Carol that the period following loss of a child is characterized by waves--waves of sadness followed by waves of joy. We're beginning to understand the truth and wisdom of her words. We're uplifted in the sad times by the knowledge that joyful times will follow. We are proud of and thankful for our little girl and we are proud and thankful for all of you who share in Joanna's desire to save these beautiful beings. Please continue to keep us in your prayers as you renew your resolve to fight for the dignity of the elephants and all God's creatures. she loved and caressed her, tried to keep her from the fright. she is free, there is a smile on her angelic face.......she is caressing , kissing. this day................our beautiful, angel girl..........found ......a new begin. I only knew Joanna for a year but she made a huge impact on my life. Her big blue eyes, easy smile, joyous laughter, passion, strength, compassion for others, and dedication and love for the eles will be with me for a lifetime. I want to extend my sympathy to the family, friends, and co workers of Joanna Burke. How wonderful that she devoted her life to these animals and that she ask that no elephant be punished regardless. If only we could stop the cruelty that these beautiful creatures endure which causes actions that result in accidents such as this. Joanna must have been a very caring and loving person. If only there were more people like her. It is so sad that her life was cut short. Once again I extend my condolences and hope that you continue the good work you are doing. Dance in the wind, For tis not the end. Flow gently as a feather might, be carried free and light. Never more burdened by the night, Joyous as a bird in flight. Like raindrops falling on us from above. Soothing, our sad hearts to mend. In our hearts they live, there is no end. She guides and guards, without making a sound. Joanna’s spirit watches, the elephants in her heart. I wrote this in honour of Joanna..my prayers are with all of you. watching the "girls" as they nap by moonlight..
She loved them in life, with all of her being. If you catch a glimpse of wings on the elecam.. It is dear Joanna you are seeing. Early on I recognized that Joanna was a force to be reckoned with. I am sure this, and her deep spirituality, are why she and the elephants bonded unconditionally. I was lucky enough to spend a very brief time as a barn volunteer supervised by Joanna. At first I was nervous, but then realized how much I wanted to learn what she wanted to teach. Every time I saw her I was amazed and impressed at how fully engaged she was, seriously engaged, even in those endless hours cleaning out the barn stalls. Each time I arrived at the Sanctuary she hugged me deeply, indicating that she knew how much this time meant to me, and even where my journey was going. One of the last times I saw her she hugged me and said. "Welcome home." She knew. On this same trip we probably talked the most we have ever. I remember how much she loved how young I thought she was, and how she swooned over how much she admired my friend Patrick. She let me hop on the four wheeler and laughed at how I was wearing a skirt and was sitting so butched out on the 4-wheeler. I remember how she responded to my question about managing the volunteers and how she had learned through a meditation that it was her challenge and mission to meet them and learn from them. If I were much younger and could learn to be an elephant caregiver, Joanna would be like the scary teacher that you really wanted to train with and knew you would get the very best knowledge. When Joanna had an accident on the four wheeler and Carol suggested I send her a care package, I made sure she got a CD by Tracy Chapman called Where You Live with one of my favorite songs, which begins: If you knew that you would die today If you saw the face of god and love Would you change. Joanna did not have to change, she was there. If only there would be more people like you and your family on the Earth, then it would be peace and love on this planet. May peace be with you and your family! This is my second visit to the site and I am just reading about Joanna's passing. I found it because of the story of Jenny and Shirley. Today was my second visit and I've been reading the stories of the elephants and Joanna. I've been here for several hours reading. It is so overwhelming. The tireless work she did to comfort and tend the broken spirits of the elephants brought me to tears. Thank you for sharing your daughter, sister, and friend with the world. Remembering you Joanna. Your kindness and compassion will be an inspiration forever. For Paul and Carol; What a special girl you had! Continue to take comfort in the knowledge that Joanna made a difference in this world. She made it better. She mattered and she still continues to touch lives. Her legacy lives on. Thank you for being a part of making her who she was. Thanks for being so nice to all of the Girls. The entire sanctuary lost a very special person- you. You took care of Tina and Bunny and Winkie, and so many more. I'm sure they miss you very much. Thanks for all that you've done to help such remarkable creatures. Never knew her, but I admire her compassion for the elephants. RIP dear Joanna, I hope you are well with your elephants above! I hope to see you one day! Joanna: I never met you but wish I had. All I read about your passion and love for the elephants convinces me that you were, and are, an angel from God for them. I believe that you see no need to 'forgive' Winkie, but only to understand her, & ask her forgiveness of us. Johanna is with her elephants, like Tina, and loving every minute. Her spirit permeates the Sanctuary and the beloved elephants still there. Such a loving and kind person! The World needs more Joanna's! Alan Yarnell, Jefferson City, TN. Joanna, You left us way too soon. But, the elephants over the rainbow bridge have the best caregiver ever. Namaste to you and all in your care. It's still so hard to imagine TES without you. But your presence is everywhere. You will never be forgotten. The Girls loved you and were devoted to you, just as you were to them. I hope they will send a little greeting to you when they next visit your grave. Requiscat in pace. We and the elephants miss you every day, Joanna. I hope that you are watching over all of the girls at TES and that you have joined the herd of all who have left here. Blessings on you and your family both human and elephant. ...gone too soon..but your love continues to grow as you watch over Sanctuary.. Thinking of you JoJo as I do every day. I miss you so very much.I was and always will be the luckiest brother in the world. Love you always. Joanna, you have never been gone, your just away. I see you clearly as you did one of your little tricks. Gum for Tarra, a shovel for Winkie, a rapid outing on the four wheeler. Happy thoughts keep you close. You are always in our thoughts, dear Joanna..... forever young, forever loved and terribly missed. This beautiful woman is love personified. An inspiration to me. As an angel, she's protecting and preserving this mission. Life is always love. There are some species of animals that I have always considered to be other forms of people. Elephants are among them. Joanna's life was short, but she was blessed to have found what she was meant to do and the chance to do it well by connecting with these special beings in such a special way. Reading about Winkie today and how she has healed over the years brings joy to my heart. I know Joanna would be proud of Winkie, and forgiving too. Tina left us on July 21 and so did Joanna. I used to think that Winkie, in her confusion and anger blamed Joanna and Scott for Tina's passing, because Winkie loved Tina so much. Say it's a stretch to believe that elephants know about anniversaries and lost loved ones, but they do. I witnessed a grieving mama elephant in Thailand on the anniversary of her baby's death, so I know they are smart and intuitive and emotional. And Winkie suffered a great deal, all alone, taken from her mama at too young an age. But I believe that Winkie is healed now, thanks to the Sanctuary and her loyal friend Sissy. It's why we should never give up, and strive to forgive like Joanna and her family. Bless. Your spirit is always among your cherished elephants and friends. god bless you joanna i love elephants too. I will always remember you. To live a life full of passion and unconditional love is what every creature should be blessed with, and a testament to this wonderful woman for being able to do just that. Her story is an inspiration. Working with elephants is great thing which you have done in your life time. Elephants be friends with humans begins according to the way the humans treat to the elephants. If friend of an elephant misses, it would be a tragic to the elephants. Tharindu Muthukumarana. I can not believe that I am only NOW discovering the LIFE of Joanna. Having been following the LIVES of the current DEAR SOULS for well over a year, or has it been longer? What a dedicated and LOVING SOUL,she gave her life in doing the work that clearly was her passion & GREAT LOVE to do.If only the rest of us could have the courage & abilities to pursue our life's work with the spirit that this young woman clearly had. I would so love to extend my deepest sympathy to her Family & Coworkers,her Friends & the Elephants with whom she spent her last moments..even though it has been a number of years now, I am finding her TODAY & MISSING HER ALREADY...MUCH, MUCH LOVE she STILL INSPIRES. I WISH ALL at the sanctuary still MUCH HEALING (Winkie, Scott, your scars of the heart) as YOU STILL MUST REMEMBER, but with LOVE & STRENGTH of SPIRIT, one as precious as Joanna. We will always remember you. You will never be forgotten. You left us so quickly; we didn't have time to say goodbye. When we get to heaven we'll see you again and then we'll say 'hello'. Just know we love you for all that you did for the elephants at the Sanctuary. Dru Swanson, Chico, CA U.S.A.
Joanna's life was a tribute to the most unselfish love. In heaven she will be blessed to take care of the dear elephants. She died doing what she loved. Bless her. I have marked Joanna's demise anniversary on my calendar and have been sending prayers to her. Even though she is not in this world, I know she watches over them where she is now. Your anniversary usually brought tears to my eyes and how the new elephants would have loved to have you around and being well-cared for as the other of your friends and colleagues are doing as well. Bless you Joanna! Teresa Chai, Kuching, Sarawak (BORNEO ISLAND), East Malaysia. Thank you Joanna for showing us a different way to live. And O that all would realize, come to the consciousness that what we are--in any given experience, or time--is the combined results of what we have done about the ideals that we have set! The way you are continuing to care for Winkie and understanding her tragic life in the aftermath of this terrible accident is tremendous! All of you are true angels to these elephants as they are angels to you. God bless Joanna's family and friends and may her life serve as an inspiration to all of us. Joanna...God gave you to those precious elephants...he knew what he was doing... as did you. To live a life loving what you do is life worth living. It is so difficult to find a calling in life and find the path we are meant to travel. You had found your path and we honor you for all the love you gave to your elephant family and how they loved you in return. We love you for all that you did at the Sanctuary. Those tender words that we all have spoken about you, are stored in heaven where you can hear them forever. God bless you and may your spirit be free as the wind blowing in the trees. I didn't know you or know about the work you did until very recently. Your love and dedication is an inspiration, my heart weeps for the beautiful creatures that no longer feel the touch of your hand. You are one of the many faces of love. To a precious girl who loved and cared for these wonderful creatures. I did not know you but read about you in the e-Trunklines news. There are Angels among us and you were and are one of them! Johanna: Your passing is the reason I have become involved with the Elephant Sanctuary. You are an angel now and a saint while you lived. Blessing to your dear parents, as well. part of their Soul remains UNAWAKENED"
As sad as it has been, Joanna left Winki footprints on this soul. Every so often you come into my thoughts. Although I did not know you, your passing really affected me. I cried for days. That is not something I usually do when it comes to a person I do not know. The reasons became clear to me. You were someone that put her dreams into action. You took all the love and commitment that was in your heart and LIVED it. Only very special people have the capability to do that. I could see that light shining through you. I cried because I knew your days of doing what you loved had come to an end on this earth but I also realized I was crying because you passed DOING the thing you loved - there are so few of us that can say that. You were livng regular life X1000. I know your beautiful spirit is fully free now. God bless you. One only has to look at the pictures of Joanna with the elephants to see what a special young lady she was. Thank you for everything you did here on earth for the girls and now for taking care of them in the green, green pastures above. As the 3rd anniversary of Joanna's passing from this life nears, I want to thank all of you who have written here. I miss her laughter and her hugs and all our talks together but if one must go so young then she went full of happiness and love. Your letters here have helped all of us heal and move forward. Joanna will always be in our hearts. She was just so loving and kind in all ways. Thanks for all your wonderful words about her. For some unknown reason I thought of you the other day, maybe it was with Bunny's death that you popped into my memory. I don't really know what else to say. You and the ele-girls were like one to me. Your presence is still strong. Sometimes sad things are just sad. I was watching a show on PBS tonight about the legacy of Dian Fossey. It made me think of Joanna. I grew up across the street from her in Massachusetts. What a sweet person she was and what a wonderful family she came from. Her dedication to The Elephant Sanctuary and her motivation to do good in this world continue to be inspiring. Joanna, I just wanted to let you know that I was thinking about you tonight. Joanna, I know by now you are watching over Bunny and Ned, helping with their transition...bless you always. Just a note to let you know that we are still inspired by your faithful dedication to the elephants and continue to plod on to try and help them in the physical world. Please say Hi to our friends, Zula, Queenie, Delhi, Jenny, Lota, Tina, Barbara and all the others who have joined you in spirit. Pray for us, Joanna, as we continue the Holy Struggle. Namaste. you awesome! You got lots o' animals that like you! Joanna, I know you were waiting for Zula with open arms. That is what gives us comfort when dealing with the sudden loss. One day July 21 is not enough for her, I did not know her but I know her kind of person. I have friends like her and I strive every day to be more like them. Let's live every day like she did in total awareness of our legacy on this earth that one day there will no other "kinds" of people but only those who live in harmony with ALL God's creatures. Joanna's spirit will live because she will be remembered by all the acts of kindness and love she gave to the animals and people in her lifetime. What better way is there to be remembered? Joanna, you've been on my mind lately. Thank you for 'being you', you are such an inspiration to me, and I feel very fortunate to have met you. You are much loved and will not be forgotten. Feeling the power that connects all living creatures is a divine experience. Ms Burke and her care and kindness will inspire us all to embrace the energy's of all living things and to connect with these loving souls. Her unselfishness has touched us all. Joanna, Wouldn't you be so pleased to see another elephant, a bull this time, released from the circus?! I'm so sure your spirit surrounds every elephant at TES and will surround Ned and make him welcome and comfortable in freedom. Joanna must have been a very special, caring, compassionate person, the kind of person that most of us never have the privilege of personally knowing. I am also grateful to her parents for honoring her wishes and not punishing Winkie. "It's not her grave here for me," said Burke's mother, Carol. "It's just the life that she had here. ... How many people can say that a loved one was very, very happy when they died. I mean that brings me a great deal of peace knowing that she was happy when she died." I did not have the honor of knowing you personally or what gifts you brought to your elephant babies. You, sweet girl, were a gift to your parents, the world, and the elephants. I will remember you now that I "know" you every day. And, I will thank God for you and I know that you are now in heaven and you are the "gatekeeper" of all of the elephants that have passed. You are loved there just as you were and still are here! May God Bless you and your family always! I turned on PBS tonight to see a piece on the sanctuary. I worked with Joanna at a restaurant in Nashville a few years back and remember her telling me about the elephant place. She said I couldn't just go and see them because it wasn't that type of place. We remember you, Joanna. We will never forget you or your total devotion to us. You are the sister of all elephants, a spiritual protector. We thank you for your help in the physical world and your continued support from the spiritual realm. Namaste, Joanna. I miss your kind and gentle spirit, Joanna, and the way that you so lovingly cared for all of "the girls." The world is a better place for the time you spent here, teaching each of us by your example; we have lost a very special soul. Joanna's Sanctuary has received two of our beautiful girls this year and I thank you for welcoming them to their final home. Namaste. You'll never be forgotten. Peace be with you. Thinking about you today and always. Just remembering a sweet, gentle soul. What would Joanna think of that? I wanted to drop a line to pay my respects this morning. I just found this website and learned of the sanctuary a couple of months ago, and I never knew Joanna, but her love and compassion for these elephants can be seen and felt throughout the site. All of "her girls", the sanctuary itself, and her family, were blessed by having her in their lives. My thoughts and prayers are with you all, for your continued growth and healing. I still hear your bubbling laugh and feel the inspiration you have given my life every single day. Love you and miss you very much. You are a true hero, one who selflessly spent your life helping elephants heal and become whole again. Your dedication is an inspiration to all. Every person and elephant who was lucky to meet you will carry your kindness towards them in their heart. Joanna, it has been two years, since you left us. We miss you so!!! What a remarkable person Joanna Burke was. I met her while attending a rally for the elephants at TES. I can still remember how moved I was by her. I am an animal cruelty investigator for Last Chance For Animals. Joanna and I actually had a conversation about my job and the difficulty of it at times. I remember the sparkle in her blue eyes when she remarked to me how important it is that there are people out there willing to do my job and to be able to endure seeing the suffering of animals in order to help them. When I left the sanctuary I continued to think about her words and her devotion to the elephants she cared for at TES. I was shocked when I heard about her death, but I know she died loving her life at TES and loving those elephants. Her love for them and her mission to heal them from thier past suffering radiated from her soul. I know she was an inspiration to me and I will remember her for the rest of my life. Joanna -- we in your old home town remember you as a little girl -- your bright blue eyes and your iron will. It is not at all surprising to any of us that you did what you were determined to do, nor that the old grey ladies who were the beneficiaries of your kindness loved you. You come to mind so many times, and I am blessed to have met you and have a picture of you and your smile. The world was a better place with you in it. Your smile and eyes told it all. I get to tell your stories that you told us, volunteers, to many people. Although it breaks my heart that the elephants on this earth do not have you, the ones in heaven are blessed. God brings people into our lives, if only for a minute and I am thankful for the "minute" I had with her. You will never be forgotten. God Bless all creatures, and everyone. She had a life that some of us only get to dream about. The sun no longer shines on your face. Who is to say you are not part of its warming, nurturing source? The dew no longer settles quietly around you. Who is to say your gentle caress is not felt in the enveloping mist? The wind no longer plays unencumbered through your hair. Who is to say you are not present in every living, singing breath? Joanna, you will live through the elephants you cared for. You will never die. Your memory will be inprinted on the minds of the elephants and the careers who so loved you. You Joanna will keep the circle of life going rather than the one in death. May you always be happy over the rainbow bridge with your precious elephants and with all the poor animals whom has suffered so much through humans. May your spirit guide you there as it did in this life here on earth. May you always feel the love. I just wanted you to know that your memory lept into my mind today! I don't know why or what it means but it brought me here to your tribute page and I wanted to acknowledge your continued presence in the lives of the Ele's and in the lives of those who admire you! Tonight I woke up of a sudden and found myself here. The sun is rising over the Sanctuary and another day is dawning for elephants who have something to look forward to, in part because of you. Just stopped by to pay my respects. Joanna, I am moved by your father's words written above but more so by your great love for these animals with no voice. Life would be quite barren without the passionate care you provided to these.....hearts without a voice, eyes that give no choice but to love them. In your honor Joanna I will always help to take care of your elephants, thank you. Dearest Joanna, What a wonderful, caring person you were. I am a great lover of elephants myself and would have loved to have known you and shared your passion. We all miss you. God Bless your precious soul. I finally saw a picture of your resting place and it is beautiful. It is so wonderful that you are buried surrounded by the creatures and people you loved more than anything. I know that you and Jenny and Tina and Barbara continue to keep TES safe for all elephants. I just recently learned of the Elephant Sanctuary and of Joanna, from a new friend. Reading each individual Elephants story left me laughing, crying, and then smiling. They are all so unique, and full of life. Circus life, and one dollar..now that made me angry! I don't believe I will ever take my children to see a circus that involves Elephants. I never knew creatures as beautiful as they are could be treated so cruelly. And Joanna, now that was an exceptional woman! Live on Joanna, through even a strangers heart! i shall not live in vain". You lived a life worth living and are an inspiration to us all. May peace and love be with your family and friends, and all of the elephants of this world. Happy Birthday Josie. We miss you. Just seating here thinking about the girls, I wanted to "re" call Joanna. So many of us didn't know her personally, but like love ones, we share one soul in many ways. We can see it in the eyes. Jen, Tina, Lota, Barbie, Joanna. Looking forward to my 2nd annual News Years Eve party with the girls! Joanna, so many tributes to you, yet my heart cries out for you. I remember when I first saw the news on CNN about a "caretaker killed at an elephant sanctuary." It was a news scroll at the bottom of the screen. I cried out "oh, no, it has to be Joanna" and it was. I went into the ES website and on the webcam I saw cars coming and going, which was so unusual. I emailed all my friends who cared about the Elephant Sanctuary and they were all in shock. So, you are buried in the most beautiful place on earth, the place you loved so much. Tina, Jenny, they are there with you. God bless you Joanna, this was your destiny. You will never be forgotten! Everyone misses you in the physical world, but we know that you are still working with your elephant soul friends in the spiritual world. Remembering how much you loved your elephant friends at the sanctuary makes our hearts glad and your devotion rekindles our passion to continue your work. Thank you, Joanna, for your gifts of love. I don't think I there are words that add anything to such a life lived with caring compassion and commitment. Thank you to a mother and father who were likely her inspiration and for sharing her with her four-legged friends. Thank you for your courage. I am so happy for the difference that Joanna made in the elephants lives. I wish I would have known her. She sounds like a great person. Now that she is in heaven, her spirit will live on there at the sanctuary. Know that she is still there with all of you. The elephants know she is still there with them. The loveliest of flowers bloom only briefly. They bring us joy and amazement in their perfection. Joanna now blooms in a place where the roses never fade. She left her gentle mark on a world where cruelty to animals lives still. Let us all be inspired by her work and continue to fight the good fight for the innocents. i am very moved by joanna's quest to care so deeply for this cause. she is a true hero in my eyes. she was blessed on earth to have such understanding and compassionate parents. I do not nor did I ever know Joanna but word of her has touched me through her father who is a coleague of my wife. I am inspired by this young woman's efforts as much by the pain that her Mom and Dad suffer in her loss. My heart goes out to them as well as to the cause that nature be permitted to prevail as it was intended. God Bless! Elephants are my favorite animals. I think it's great what Joanna Burke did, saving elephants. I'm sure lots of people will appreciate it, forever. It was shortly after the death of Steve Irwin that I went on to your site and discovered the great loss that all at the sanctuary had suffered. I never met Joanna, nor did I even know she was part of the sanctuary. But after reading about her, and viewing the images of Joanna and the elephants, it was clear that our entire world had suffered a tremendous loss of such a grand human being. I was filled with deep sorrow. Sadness still wells up inside me when I think of the sanctuary and the absence of Joanna and Jenny. But then I think of their spirits in the wind, blowing through the leaves of every tree, and enveloping all that they loved at the sanctuary, and I feel alot better. If there are elephants in heaven Joanna is sure to find and love them. I remember at EARS 2005 while we waited for the road to be cleared. Joanna told us how the Girls loved the rain. One day in a thundershower she went out to check how they were doing. She came across Tarra having a blast in the rain. Joanna proceeded to share that rain dance with Tarra. I always have the visual of Joanna, the light in her eyes and the joy on her face as she told us this story. Her 'being' was so powerful. I could feel and sense that there would be really nothing better than doing that rain dance with her friend and mentor, Tarra. This quote by Joseph Campbell remind me of Joanna: "The goal of life is to make your heartbeat match the beat of the universe." I did not know Joanna Burke but after reading about her, I feel inspired by her work, her love, her passion. I feel I owe it to her memory to continue my own work in animal welfare with the joy she had everyday. She will be missed by humans and animals alike. Joanna Burke was a very inspiring woman with a heart full of love and respect for all the elephants and people at the sanctuary. In a world like the one we live in. this is rare indeed. Although I never knew her, I am inspired by the way she lived her life. May she be free of all suffering and stress. To follow your heart, to feed your soul - this is what we are all meant to do, to live fully. Joanna knew this, she lived this. When the light is saturated on the day, I swear I catch a glimpse of you, Joanna, running across the pasture, seeing to it that the girls are getting their vitamins and reminding Minnie that she is a lady first, then an elephant. Stick around, won't you? To Joanna's dear Mama Carol and Papa Paul with whom I share complete empathy, your example of courage and dedicated continuity of your daughter's spirit has provided a blessed confirmation of the path we must continue to walk with Joanna, a path that was illuminated for me personally by your daughter's extraordinarily certain visions of the unmistakable identity and companionship of a certain angel's presence with whom she surely now shares a tangible bond. Her example and gift to the universe in her most special personal authenticity and belief in the value and purpose of every living creature will thrive and live forever. I miss you my dear friend . At EARS 2005 we had lunch with Joanna by the lake. She indulged us with a Q and A session. Someone asked about making a path down to the lake. Joanna let us know in no uncertain terms that she wasn't about to clear a path for us. After a pregnant pause, the Q was clarified. No, she wanted to know if a path would be cleared for the elephants. "No", Joanna said, "they can do it themselves." Joanna made the ultimate sacrifice, she gave her life. My thoughts are with you, Paul and Carol. I know you were there to greet your dear Jenny and continue to care for the heavenly heard whilst still watching over all your friends at the sanctuary, animal and human. God bless you Joanna, this world has lost too many wildlife angels of late, Steve Erwin, Jim Cronin and yourself continue to inspire us mere mortals and for this we are forever grateful. Millions of bright stars shine in the darkness and remind us that there is hope and love, and that there truly was "only one ladybug like that one." Joanna, we miss you greatly, and yet know that you are forever there to guide all of us here on earth. We will strive to follow your lead. There is no way to say goodbye to a soul that has so touched the earth and all who shall ever tread upon it. To live your life's passion and to do it with such heart and dedication is a level to which many aspire and few ever come close to achieving. In your too-short life, Joanna, you soared. You have taught us all so much about living and about respect for life...all life. Your Elephants will never forget your tender touches and your gentle heart as their days are filled with much light for having known you. To be able to be a part of such a huge and noble undertaking as to bring these wounded 'Girls' to a patch of heaven in Tennessee is a heaping on of positive Karma. I know that you remain within the habitat in body as well as in spirit because I know that your purpose was to always be 'The Caregiver' and it is a position that you will never abandon. I know that it was your compassionate spirit, which helped Winkie through those long weeks of depression, sorrow, remorse and personal torture for her actions that lead to your loss of physical life. We can see it every day as we watch Winkie's soul heal and her heart slowly and cautiously open to all with whom she shares her life. You are gentle and kind, Joanna, and with each passing day, we all miss you more. Your bright light guides 'The Girls' and your voice whispers on the wind like a lullaby to soothe them. Your life was a blessing, your passing, a crushing blow to all who knew you, your spirit, a constant grace to a world that hungers for the compassion and love that you gave so freely and unconditionally. Namaste ~ Celebrate the light that is life! This day is burned into our hearts for all of us who loved Joanna & Tina, both deaths coming with shock. I don't believe it is a coincidence that Joanna died on the same day our Tina died. Mr & Mrs Burke, you have been so generous in your grieving spirit to share with all of us out here in ele land little details of Joanna & the funeral and to selflessly direct support for the sanctuary that Joanna loved. Thinking of everyone today...human & animal at the sanctuary, especially Winkie, and out here in eleland, may all our "gentle spirits" be united, that this day would not only reflect our sadness, but spur us on to continue reaching out to advocate for all who need our care. If we all lived our lives as if Joanna was nearby, giving us her thoughful ideas about all life, I know the world would be a better place, and I would be a better person. There would also be an increase in wise and witty humour. The ele-angels have a wonderful caregiver. Please continue to watch over the earthly ones as well - your love transcends! As I read the words written below by my wonderful wife Carol, Joanna's Mom, I don't know how I could do better. Carol has a special way of expressing matters of the heart. It's been a year since we received the crushing news about Joanna's death--news, I am told, a parent isn't supposed to hear. What a loss that represents, what a hole it leaves in one's heart. But from the earliest days after Joanna's death through today, I've been buoyed by the heart knowledge that Joanna's spirit lives on. Many moving moments of grace have occurred to help heal the hurt in my heart--Bunny in a field nearby trumpeting loudly as we gathered to bury Joanna and were asked to say a few words; the massive wind lasting 5 minutes that followed Bunny's bellow on a day that minutes before had been dead calm; words spoken by Joanna's friends and acquaintances at the funeral home and at home; moving words written in tribute to Joanna's life on the web site and in cards Carol and I received; and those memories, hundreds and hundreds of memories, wonderful memories sparked by photos, events, and yes, even anniversaries like today. in your prayers, your thoughts, your heart. Yes Joanna, I miss you so very much--your smile, your sense of humor, your many and varied faces, your caring. But I know now more than ever that you live still in the hearts of those who knew and loved you and that we will meet again one day. Till then, my little girl, the beautiful presence of your caring spirit fills my heart, bringing healing and much joy. moving silently in their sacred space. How does one pay tribute to a soul so precious and rare. Who gave of herself so freely, every moment she could spare. We watched her on the elecam, Tina's true devoted friend. A tiny little woman, calmy reading while Tina soaked her feet beside her friend. That one picture says it all, no caption ever needed. To see the bond they shared, two trusted faithful friends. I was grateful to be given a glimpse into their world, to share with them those moments, I felt part of their herd. Many people come into our lives and leave a memory. Joanna left me more than that..she showed me a glimpse of a love so heavenly. I know that she is guiding us towards helping elephants. I have a feeling she also helped finally get Nicholas to PAWS. I have no doubt that it was our precious Joanna that finally found him the home he has been waiting for. Whenever an elephant reaches TES, it is Joanna that leads them home. I can imagine her joy when Dulary arrived. She probably helped Winkie make her feel at home. I feel a little safer and hopeful in this world after sharing a little of Joanna's life. Even if it was by elecam or TES diaries, she showed us how beautiful and giving humans can be. May we all be a little more like Joanna..what a beautiful world this would be. Namaste my elephant friend, please hug Tina for me. The tears are here, with a quiet dull pain. Every day of the last year was difficult, so why now I ask? This is one of the saddest anniversary dates I have in my small life in Minnesota. Thanks is not enough for the selfless courageous work and creation of the sanctuary. Bless you all. Bless all who have have passed through. Thank You Mr. & Mrs Burke for Joanna. She was a gift to the world. By all accounts you lived your life with passion and compassion for and with your beloved elephants. Our world is a little better off for your effort, care, and concern for the "girls". May your family, friends, co-workers, and fans find comfort and solace on this anniversary. You will be missed !! Knowing your mother as a beautiful, kind and loving person it is not hard to imagine what a special person you were to all who came in contact with you and your work with such magnificant creatures. Your time here was short but the lives that you touched and continue to touch through your work and through your love of life and your family is felt everyday. Joanna, as a human being and a dedicated caregiver, you went above and beyond for the elephants when you graced this world with your presence. Since you have moved on to the next world I have no doubt you are doing the same for the sacred souls you are watching over. You will forever live on in the hearts and minds of all that have known of you. My tears are flowing freely tonight as I write this, but my heart is at peace. I could not have asked for a more wonderful daughter than I was truly blessed with. As her mission in this life moves ever onward, the support and love we have received from the world has kept me going. I know that Joanna must be in a truly wonderful place and continues to be happy in return for all the love and caring she gave to all of us. I miss her so much but I know I will see her again someday. Until then angel, I love you. But yours was a much briefer span. On July 21 I will be at an outdoor rock concert (with ear plugs). In honor of Joanna, I will hand out a couple hundred little flyers about The Elephant Sanctuary: the Mission Statement page I copied. I will connect with each person, sending energy to the rituals of remembrance at The Sanctuary, and to Joanna's spirit in particular. Joanna, wherever you are, I want to tell you, we remember you. Your life was special, and you got to live a portion of it as almost a dream, with the large, wise ones of our earth. Now I believe you inhabit a space with their even larger spirits lovingly encircling your own strong and beautiful one. Be at peace and feel the endless love. I have not met the person you were on earth, but I am familiar with the love that you shared through those who did know you. I know you are still an Angel, watching, protecting, busy in your work, probably busier than ever as I assume you do not need sleep now. We have learned so much from you...how to love, how to care, how to live in the heart. Thank you, thank you, thank you, for all you do from all of us who still hold the earth in their hands. many blessings to your family, Joanna, the people and the creatures that you touched. on July 21st i shall make a point to reach out and do some act of kindness to some creature of this earth. i shall do this because of you and your life with the elephants in Tennessee. thank you for making the world a better place. You touched the hearts and lives of "your girls" all you came in contact with, and many you never knew. You are deeply missed, and your life is an inspiration to us all. It was an honor to have met you, and work with you. Your passion was so true and pure. The world was blessed because of you. It seems only yesterday and you are surely missed by the "girls" but God needed help with his "girls" - there are so many needing that special care which was Joanna - and I'm sure you are providing not only that help but giving the wonderful care and love you did on earth. Missed by all who knew you and the many of us who never had that opportunity! Joanna, I will never ever forget your loving and kind nature. We worked with you on several volunteer days and you were always the epitome of kindness and grace. You are gone from us on this earth but you will never be gone from our hearts. May God Bless and keep all of you, and know that Joanna is resting in his arms..
During her short time on earth, the quiet and modest Joanna Burke profoundly influenced and ministered to the hearts and minds of all species blessed to live within her reach. In and through her death, she has been able to touch tens of thousands of human hearts and minds toward the continuation of her work on a broad scale. Isn't that the definition of a saint? Previously, she had only two hands to do her work. Now, she has thousands and thousands of hands to fullfill her calling and vision----maybe to a larger scale than she could believed possible but surely would have wanted. Massachusetts, Joanna's and also my home state, boasts of producing many distinguished people who's work changed lives for the better, and Joanna is up there at the top of the list. Heartfelt condolences to her family and friends of all species who personally love and miss her. What a lovely, caring person she was. I'm sure she was reunited with the elephants who went before her at Rainbow Bridge and they are there now, welcoming the newcomers like Jenny. My sincerest hope, wish, and dream is that Tina is looking after you as you once so generously looked after her. That you are both in the happiest of places with each other and all the beings you both love and hold dear and all of the elephants who've come and departed and are free. Namaste, dear one. When I first spoke and saw Joanna I was mesmirized for there was a softness and caring that oozed with every fibre of her body. Everytime I see the sky full of stars, I think of Joanna and say to myself she truly was a star that deserves to be visable. Somewhere in the universe her spirit was needed more. A person like Joanna is a universal angel and I believe, a very special a guardian for very special elephants. Joanna, I didnt know you but I read the stories and see your beautiful face and know I shouldnt cry tears for you but rather my tears I shed are for the elephants who so desperately need you and love you and have to go on without you. It hurts my heart because elephants have been part of my soul for acouple of years now. seeing the abuse of barnum and bailey videos nearly ripped my heart out and I couldnt bare to watch but it also hardened my heartenough to continue watching...searching the web to see how I could help;;;then I happened upon the sanctuary and it made my heart hopeful again.carol scott and all the special people up there in Hoenwald have made me want to dedicate my life to elephants, 'every time i knew one of the girls was coming down from the hawthorne barn the excitement and feeling of Joy in my heart made me giddy with delight and i would watch as long as it took to make sure each elephant was out of the truck safely and to see them greeted by there sisters was a real joy for me.I do hope to volunteer soon but until then remember those girls loved you...just look in their eyes...the mirror of their souls...Peace be with you always Joanna and remember you were the girls girl as much as they were yours. Joanna's smile is shining down on every animal on the planet. Your connection is and will be forever with all of those who love you. It's insane to think that a year has already passed..it seems like it was just yesterday when she was spending time with all of the girls ..she will forever be in all of their hearts, as well as all of our hearts. Her legacy will live on forever. Joanna we love and miss you dearly.. I couldn't hold back my tears today as I read of the State of Tennessee's Resolution Honoring Joanna. I've been thinking about this date for weeks now, wondering how everyone at TES has been dealing with it. What a beautiful gesture for an incredible person. I forsee wonderful spirits flitting about the Sanctuary celebrating her life and Tina's and all the other elephants on Saturday. It may be a sad day, but surely it must also be a joyous day as well. I think of Joanna every day. I did not know Joanna, I only learned about her through the sanctuary website. What I want to say is, I talk about Joanna to my family. I talk about the sanctuary to anyone who will listen. I hope by bringing attention to these elephants, and all elephants, is what Joanna would want. In Minnesota, they are trying to pass a law for no animal circus acts. A radio station I was listening to could not understand why. I wrote them, shared your website, and shared stories of what these creatures live and suffer through everyday. I believe it was Joanna's life story that drove me to try, in a very small way, to educate a small population of people. I think of Joanna everyday. I think of the sanctuary everyday. Bless the sanctuary, bless Joanna, bless her family, bless those in need of the sanctuary. I can hardly believe a year has gone by since that horrible day we lost Joanna. I know her beautiful spirit lives on at the Sanctuary and in the hearts of all who knew and loved her. And we know she's giving good care to the girls who are with her now. Once a volunteer was working beside Joanna helping to paint the African elephant barn. There were millions of ladybugs flying around everywhere, and hard as this volunteer tried to avoid them, sometimes one would land in the path of her paint roller and could not be spared. "Oh well," remarked the volunteer in defeat. "I guess it's not like there aren't plenty more ladybugs around here to take its place." "Maybe so..." said Joanna, "but there was only one ladybug like that one." To this day, every time I see a ladybug I am reminded of Joanna. Clearly, there was only one like her, too. Your dedication to the care of those beautiful elephants is an inspiration to all. Your life's work was selfless and your dedication knew no bounds. Not many people could care for a 8,000 pound animal, but you did. Not just one but many and they loved you for it. I pray your family's grief is short. You are missed and loved forever. I hear your voice in the wind amidst the trumpeting of those that reside with you. I see you in the clouds wrapped in trunks of love. I feel your heart beating with the pulse of the earth. Even though my heart aches with your absence, my soul rejoices in knowing you for even a short time. I have a picture of Joanna talking to my friend Jill and me when we volunteered. I have never forgotten one word that she said to us that day, as we were all mesmerized by her, jealous of how she got to spend her days with "her girls". I will never forget her talking about "Sis and Winks". In all of my life, I will never forget the feeling of talking with Joanna for that one hour, feeling like it was a lifetime, and wishing it was. Peace to you all. that turns the brown earth green again. Now I must add that dear Jenny has joined the angels. Every mention of The Elephant Sanctuary brings memories of Joanna and the continuing inspiration of her loving care for the elephants.